The other day I posted a photo on my Instagram account (@BrianLohnes) of an old monster truck and one of the responses it got was a guy saying, “They actually raced these?” At first I was going to be like, “Dude…c’amon”. The I thought about it and he’s probably a kid that never saw the true golden age of monster truck racing. The stuff that happens now is entertaining and all of that but in terms of the straight up, craziest stuff ever? That was the freaking 1990s. With chassis evolving and plenty of horsepower to be overused, the trucks flew, they bounced, they broke, and they wrecked with huge chaotic results. It was not like today where you just slapped another fiberglass puppy head body on it. No, most of these things had some form of steel on them. 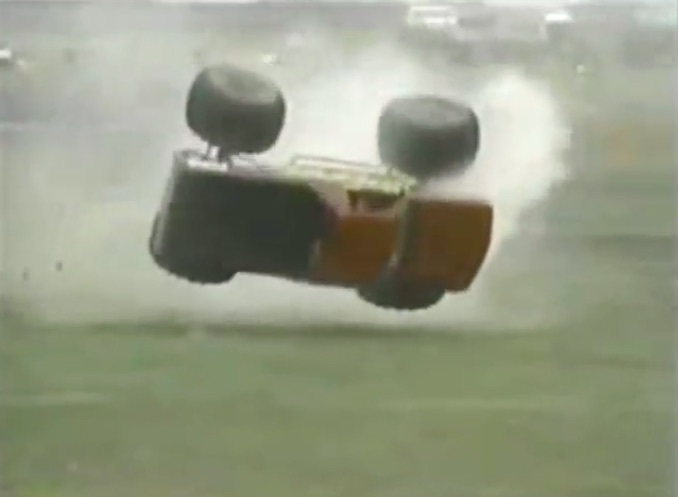 The video below shows a myriad of crashes from events all over the place but mostly from the really fast track at the 4-Wheel Jamboree event which was part of the Penda Series that was broadcast on TNN each weekend. If I was a kid and all I ever saw was Monster Jam, I’d like the trucks but when you saw them literally going head to head, flying through the air, smashing to the ground, and occasionally wiping out a building or loads of water blocks, that kept you on your toes! This is a fun and sometimes funny look back down memory lane. No, the resolution is not 1080p but who cares. This is fun stuff. The drivers walked away.